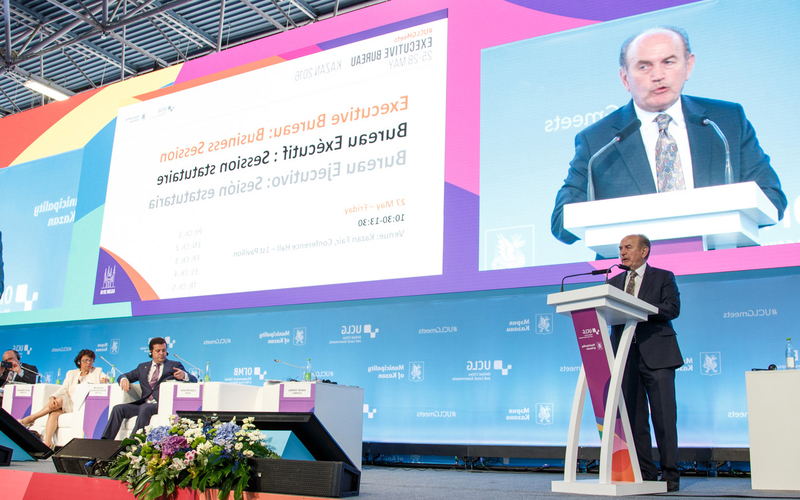 Our Executive Bureau took place in Kazan from 25 to 27 May with over 200 representatives present from some 90 cities and local and regional authorities from all around the world, along with important figures from the urban world. 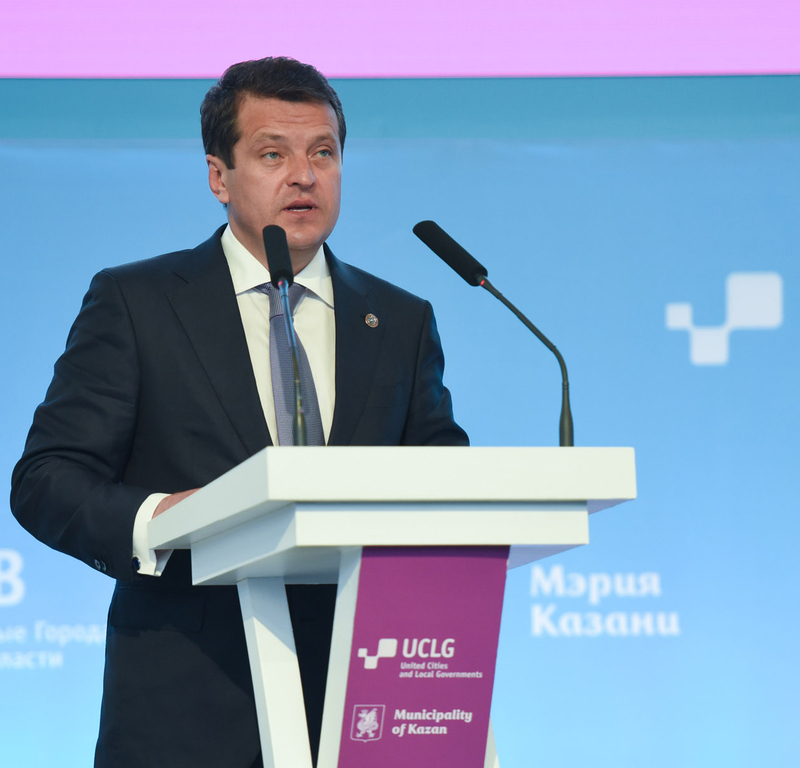 The meetings in Kazan are the last time that the UCLG governing bodies will come together before they meet at the World Summit in Bogota, which will take place from 12 to 15 October this year. The Mayor of Kazan, President of the Eurasian Section and Co-President of UCLG, Ilsur Metshin, opened the Executive Bureau meetings together with the President of Tatarstan, Rustam Minnikhanov; President of the State Council, Farid Mukhametshin; the Mayor of Victoria, Seychelles, Jacqueline Moustache-Belle; UCLG Secretary General, Josep Roig; and the economics professor Richard Florida. The opening session was attended by representatives from cities in Europe, Asia, Africa, Latin America and the Middle East. "In a very short space of time, UCLG has become an influential global organization, by successfully promoting cooperation between cities and effectively defending the interests of local authorities. Over the next few days, Kazan will play an active role in the global municipal movement". Ilsur Metshin stressed the importance of continuous dialogue with urban communities. "Our main objective is to create a pleasant urban environment, by providing a decent life and working conditions for citizens. It fills me with pride that leaders of cities and regions are increasingly willing to share their experiences and knowledge with other colleagues",declared the Mayor, thanking the first President of UCLG, the former Mayor of Paris, Bertrand Delanoë, and the current President of UCLG, the Mayor of Istanbul, Kadir Topbaş, for their contributions to the organization. Ilsur Metshin also praised the creation of a global network of city authorities, and local and regional governments as the organization’s principal achievement. Kadir Topbaş, who joined the meetings on 27 May, celebrated that UCLG gathers in all corners of the world, and thanked the Mayor and his staff as well as the citizens of Kazan for their hospitality. 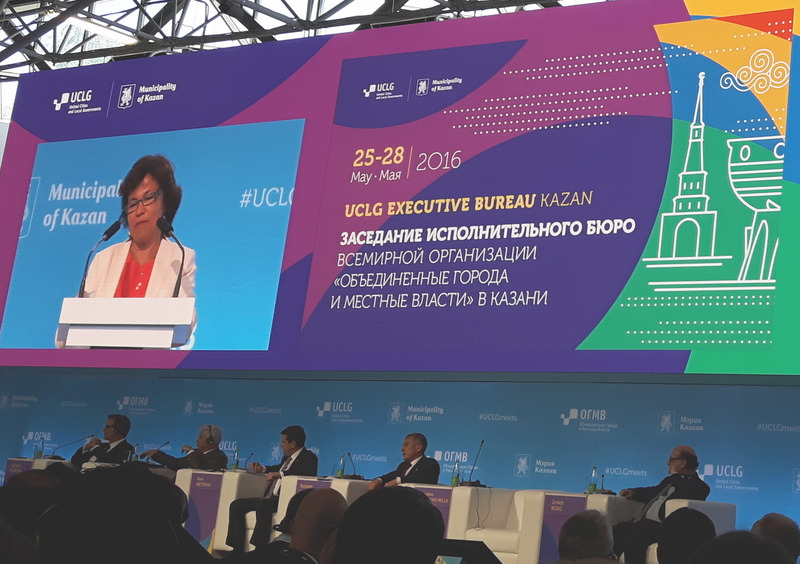 The meetings in Kazan were held a week after the intense days in New York, where a large delegation of members of UCLG and the Global Taskforce attended the Habitat III Local Authorities Hearings and the first session of the World Assembly of Local and Regional Governments. In this respect, in her opening speech, Jacqueline Moustache-Belle recalled the main messages and the vision of local and regional governments for the development of the international agenda: 1) Strengthening local democracy and citizens’ capacities; 2) Working towards the recognition of the key role that local governments play in developing the international agenda, and not only in implementing it; and 3) Gaining a place at the international negotiating table as a sphere of government, in order to contribute to the debate and to the decisions. At the Kazan meetings, the main recommendations of the Global Report on Decentralization and Local Democracy (GOLD IV) were presented; the consultations leading to the development of the report have informed the positions of local governments in international agendas. In addition, a Declaration on Intermediary Cities led by the Mayor of Chefchaouen, Mohamed Sefiani, was adopted, as was the recommendation for the UCLG World Council to adopt a policy paper on Local Economic Development, which the Mayor of Las Cabezas de San Juan and President of the Andalusian Cooperation Fund 8FAMSI)I, Francisco Toajas, presented. 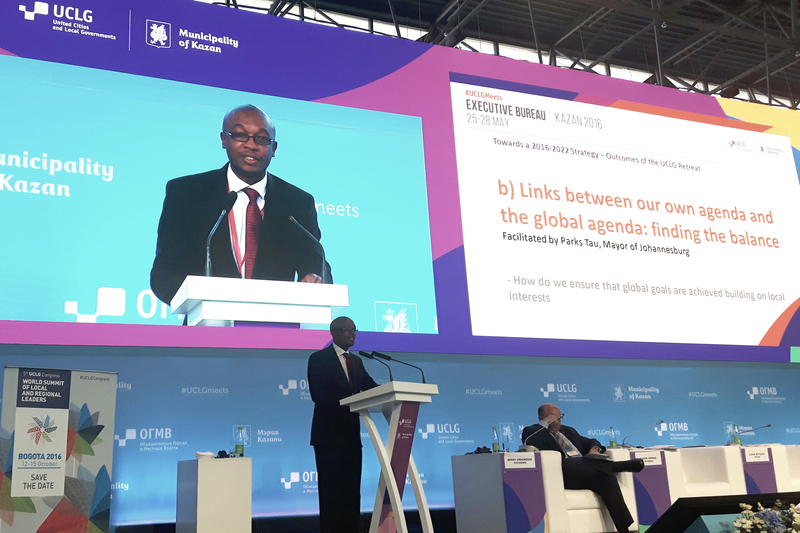 The UCLG Learning Agenda also had a dedicated slot, and was presented by the Mayor of Durban, James Nxumalo, who stressed the need to strengthen the exchange of specific experiences between cities and to structure the agenda around the Sustainable Development Goals. The governing bodies will be renewed for a three-year mandate at the 5th UCLG Congress in Bogota. The Mayor of Johannesburg and Co-President of Metropolis, Parks Tau, who had already submitted his candidature for the Presidency, shared his interest in helping the organization to take on a leading role in implementing the development agenda and New Urban Agenda with the Executive Bureau. The Mayor of Kazan and Co-President of UCLG, Ilsur Metshin, also expressed his commitment to the organization and his intention to submit his candidature for the Presidency. In this respect, he declared that the priority for his mandate would be creating a web portal as a place for exchanging best practices. Candidatures for the UCLG Presidency, Co-Presidency and Treasury can be submitted until the end of June. The elections will take place at the World Council held on 15 October in Bogota. Our movement is independent and it needs to represent the interests of all. UCLG needs to expand on its mandate to represent beyond its membership. Now, when so many interests are at stake, when so many want to provide technical solutions and drive the international agenda, it is up to us to contribute to the independent voice of local and regional governments," recalled Co-President Moustache-Belle. The agenda included the meetings of the Working Group on Intermediary Cities, the Taskforce on Local Government Disaster Response, the Committee on Urban Strategic Planning, the Financial Management Committee and the Committee on Statutory Affairs. On the second day, debates were held to exchange best practices, which provided the opportunity to discuss priorities for ensuring a sustainable future for our cities, the path towards transparent governance, living together and the development of sustainable tourism. These meetings featured speakers from a range of backgrounds, such as economists, urban planners and international experts, among which the former Mayor of London, Ken Livingstone, Jose Asebillo, Vukan Vuchic, Mikhail Blinkin and Richard Florida should be highlighted. After the success of the first UCLG Culture Summit in Bilbao in March 2015, and in view of the growing importance of culture within the framework of sustainable cities, the Executive Bureau decided, following the recommendation of the Committee on Statutory Affairs, that Jeju will be the host city for the second UCLG Culture Summit in 2017. Eduardo Vázquez, Secretary for Culture of Mexico City, announced the winners of the second edition of the “International Award UCLG – MEXICO CITY – Culture 21” during the Executive Bureau session in Kazan. The winners in the “City, local or regional government” category were Timbuktu and Vaudreuil-Dorion, while Jon Hawkes and Silvia Rivera Cusicanqui received awards in the individual category (more information on the Jury’s decision can be found here). The special sessions focused on UCLG’s Priorities for 2016-2022, a triennial exercise that takes place in the lead up to UCLG Congresses and culminates during the early period of the new UCLG leadership, spring 2017 in this case. Facilitated by Richard Kemp, City Councillor for Liverpool, the aim of the session was to identify the priority areas and issues to be addressed in the new strategic document. The session included statements from Parks Tau, Mayor of Johannesburg, and Berry Vrbanovic, Mayor of Kitchener and UCLG Treasurer. Encouraging the participation of political representatives with specific mandates, strengthening collaboration as a network, scaling-up activities at regional and national levels in order to make them better known, and building the capacity of members were highlighted as the key axes for the next stage of the organization’s work. The programme for the World Summit of Local and Regional Leaders and the 5th Congress, which will be held in Bogota, is closely linked to the organization’s general priorities and the Habitat III Conference, due to be held immediately after the Summit, from 17 to 20 October in Quito, Ecuador. The Executive Bureau commended the hosts for the effort made to provide an inclusive and diverse space. The importance of discussing general policies and creating formats that would make it possible to experience the reality of Bogota as well as developing learning sessions was stressed. The membership expressed its enthusiasm for the Congress format and made a commitment to ensure a representative presence in Bogota. The report of the main decisions will be available soon.